Last July, I broke a story about the existence of Boeing’s F-15X Advanced Eagle concept, one that the plane-maker had been in discussions with the USAF about for many months. That aircraft would be procured to replace America’s existing F-15C/D aircraft, the vast majority of which are operated by the Air National Guard. 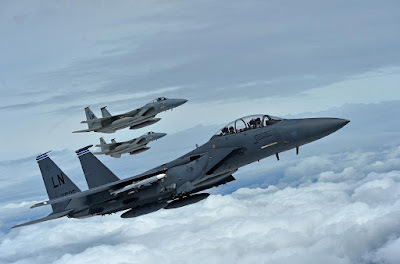 Since my expose, the USAF has officially remained somewhat flippant about the F-15X and its talks with Boeing, which isn’t surprising, but according to a Bloomberg report, that is about to change dramatically very soon. The F-15X airframe would be single seat, but it would incorporate decades of innovations that are being applied currently in the latest F-15 Strike Eagle derivatives being purchased by Saudi Arabia (F-15SA) and Qatar (F-15QA). With an airframe life of a whopping 20,000 hours, and the latest sensors, flight control systems, and avionics, the F-15X would serve for many decades at an operating cost that Boeing claims will trounce that of the existing F-15C/D fleet—the youngest of which is now 32 years old—basically paying for the airframes with savings within about a decade. WNU Editor: The Pentagon may want to buy these planes, but the Air Force does not want them …. The Pentagon Wants To Buy A Dozen F-15X Fighters The Air Force Doesn’t Even Want (Task & Purpose).